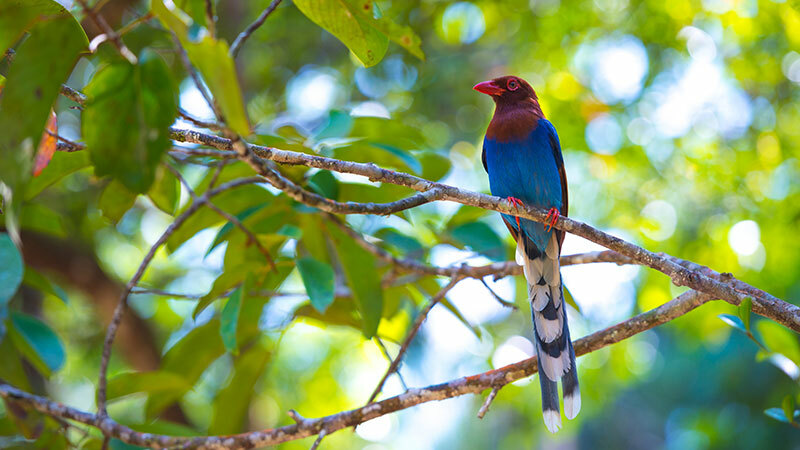 The island is home to many bird’s species which includes resident breeders, migratory birds that make the island home during the months of October to March and 33 species of endemic bird which cannot be found anywhere else on earth. The months of November through to April are considered the best months of the year to spot most of these endemics. The Kithulgala and Sinharaja forest reserves in the low lands are amongst the top spots to view most of these endemics. Horton Plains National Park in the hills is the best place to catch the endemics that enjoy their life at altitude. The winter migrants come from distant Siberia and Western Europe. The reservoirs attract vast number of water birds. The forests attract many other species. There are many bird sanctuaries across the little island of 270 km by 140 km in size. Kumana is situated in east Coast, Bundala, Kalamatiya are is in the southern coast, Sinharaja Rain Forest, Udawatta Kale, Bellanwila, Muthurajawela, Minneriya, Kitulgala and Minipe are other important Bird watching locations for Migrant birds. In additions you can see birds throughout the country in pockets of forests, lakes, lagoons and river sides during your travel.